While this may be good news for bankruptcy lawyers, it is probably not very good news for the broader economy. After all, bankruptcy is generally used as a last resort when a person’s debts become unmanageable, sometimes because of irresponsible use of credit, but more often as a result of a sudden change in one’s financial situation, such as loss of a job, or sudden medical expenses. Sadly, it seems that Americans are facing these calamities more often than ever in recent memory, when they are least prepared to deal with them. With wages failing to keep up with inflation, and prices of many important products and services, ranging from food to higher education, growing at rates that actually exceed the overall inflation rate, you have a recipe for financial hardship that cuts across a wide swath of American society. Bankruptcy is generally (and accurately) viewed as an emergency safety valve, getting rid of debt that is growing faster than it can be paid down, averting financial catastrophe for an individual or a family. 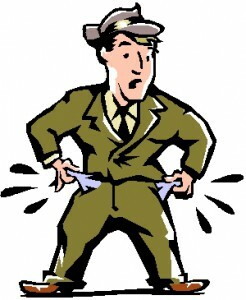 Bankruptcy allows a person to discharge some or all of their debts, doing away with the legal obligation to pay them. Other forms of bankruptcy can reorganize a person’s debts into a single monthly payment that’s designed to be more manageable than their current situation. Of course, like any emergency measure, bankruptcy is not to be employed lightly, and one should definitely not rack up a large amount of debt, relying on the idea that they’ll be able to wipe it out by going bankrupt. Bankruptcy definitely has its costs. For instance, filing for bankruptcy will virtually ruin your credit rating for years to come, making it very difficult to get credit at a reasonable interest rate. This means that buying a home or a car for a reasonable price will not be easy for the foreseeable future. Furthermore, bankruptcy lawyers charge for their services, and their fees can often run in the thousands of dollars, even for relatively “simple” cases filed on behalf of individuals or married couples (as opposed to businesses). Obviously, you should only consider filing for bankruptcy if the debt that you expect to be discharged is far greater than the fee charged by your bankruptcy attorney. However, in some cases, filing for bankruptcy can be a rational decision. And recent LegalMatch case data from the last several months bears this out. People are seeking legal advice on bankruptcy in very large numbers, and, in many cases, they are seeking to discharge credit card debt and medical expenses, which are usually the “best” types of debts to have when filing for bankruptcy, since they’re unsecured and dischargeable. More disturbingly, however, a fairly large number of people are seeking legal advice regarding bankruptcy and student loans. Unfortunately for them, it’s virtually impossible to discharge student loans in bankruptcy. This makes student loans a particularly risky form of debt to take on. It also illustrates that, given the skyrocketing costs of higher education, an increasing number of people apparently don’t believe they’ve gotten their money’s worth out of college or graduate school. In the last few years, there has been talk that higher education, and the debt that it generates, is a bubble that’s waiting to burst. After all, a huge number of young adults, fresh out of college or graduate school, are entering the workforce every year. Their numbers far exceed the number of jobs created each year which require the level of education they’ve attained. It should come as no surprise, then, that many recent college graduates, sitting under a pile of debt, looking at lukewarm job prospects, might view their college education as a waste of time and money, and seek to at least recoup the financial loss. But, as I mentioned earlier, the current bankruptcy laws make this nearly impossible. I don’t pretend to have a solution to this. And maybe the fact that the increase in bankruptcy filings is at least slowing down (even though they’re still increasing) is more of a silver lining than I’m making it out to be. However, the numbers certainly paint an interesting picture: the economy is still bad, and it has spared virtually nobody. Well-educated professionals seem to be in just as much danger of losing their job as a factory worker or janitor. This likely means that bankruptcy rates are going to continue to be high for the foreseeable future.